As a leader, you encounter people who are in financial trouble. Statistics show that over 70% of Americans live paycheck-to-paycheck. OVER SEVENTY PERCENT! For business leaders, it has been shown that people who are struggling financially have lower productivity, are prone to attendance issues, and pursue raises constantly, solely because of their financial need. For pastors, it is clear that people who are struggle financially will also struggle spiritually. It is also means that these people are unable to give as they want to. I have a question for you. What are you doing to financially equip your people? WE MUST EQUIP PEOPLE! If we do not, who will? Marketers and salespersons looking to make a huge margin, that's who! I am on a CRUSADE to help people with their finances! I cannot simply stand by and watch others struggle with their finances the way that I did! I cannot simply stand by and see others struggle while KNOWING that there is A BETTER WAY! I will travel the planet to proclaim this! I want to help you! Here are ways that I can help. Financial Learning Experience – A 2 to 5 hour class (Custom-designed to your staff/congregation/employee needs). It is a practical class that is focused on the “how-to” of sound money management. I LOVE taking the crusade on the road! The recent road has included teaching in Easley, SC, N. Myrtle Beach, SC, and Atlanta, GA. The future road already includes Atlanta, GA. This road will soon include Texas, California, Washington, Minnesota, Wisconsin, and Indiana. More to come! 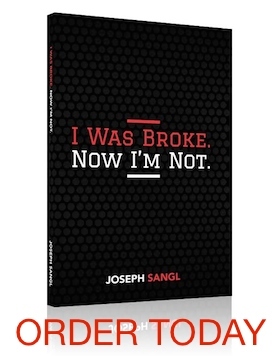 www.JosephSangl.com – This web site is chock-full of information and practical tools that have changed entire financial futures! Want to bring the Financial Learning Experience to your location? Contact me HERE.